There reigns an empire of stately stature, whose strength is in the victorious winners. 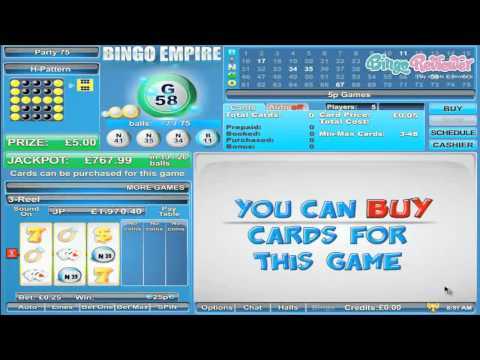 Bingo Empire is sophistication and simplicity all roll into one premier online bingo. Feel the energy; see the action and experience power of winning. Cloaked in an envelope of stately blue and steel silver bold letters is Bingo Empire. The homepage stands on its own merit in a polished design that is not overstated. One of the most impressive features is having access to the lobby before registration. In full view, the details of all there is offered is visible. It gives a “look before you buy” approach that symbolizes the pride in their products. There is a confidence that invites players to the Rate Bingo Empire tab with a 1-10 rating system. The numbers tell the whole story with a higher than average voting scores from those who know best, the player. Bingo Empire is owned by Plex Gaming Ltd and powered by Byworth Entertainment software. They are within accordance to international law and licensed in Netherlands Antilles. The Online Bingo Shop offers wonderful products that can be purchased with the players Bonus Bank. Bingo Empire caters to all their customers needs with play, win and shop features in one magnificent spot. If you are a true bingo player at heart, Bingo Empire caters to all your whimsical needs. There are not too many online bingo halls that carry all variations of bingo like they do. Here you find every variation of bingo available with 90 ball, 80 ball 75 ball and 30 ball bingo. Yes, it’s a bingo player’s delight. The minimum card purchase per game is 3 with a maximum of 100 cards in play at one time. Bingo cards typically cost .25 each with specials for a penny, nickel and dime as well. Side Games, Chat and Progressive Jackpots are showcased. Free Bingo rooms offer free play with a chance to win cash prizes. The slot selection is small but offer quality graphics with 3 reel, 4 reel and 5 reel machines. Casino Games and Instant Games achieve the ultimate package of games. You are cordially invited to partake after registration in a free No Deposit Bonus to explore Bingo Empire compliments of the house. Take advantage of the Deposit Bonus on your very first deposit with Reload Bonuses on all future deposits. Bingo and Slot Tournaments work the same way with the top ten players with the most wagers during each month winning a prize. A leader-board tracks the progression of the top winners throughout the month. A Loyalty Point program rewards players with points on all wagers made. Points are redeemable for Playable Bonuses once a minimum of 1000 are earned. To view your point balance, simply log into your account. Daily Specials are highlighted with innovative offers including BOGOF, BBs, Chat Games and much more. Huge campaigns are periodically offered with large cash prizes and holiday excursions. With every bingo variation available, it is a bingo player’s ideal site. Full access to the game lobby before registering is an impressive feature allowing players a panoramic view before signing up. We rate Bingo Empire with 4 Pink Hearts. The first thing that I saw was a fact that no US players are allowed in, and sadly, that is quite a coming thing. The site OK, but it is not made to fit large, high resolution screen nicely, and that is the only complaint. All the important links are there, and the navigation is really fast, no wasting time on searching for relevant information. It is a Byworth site, and that means two things, first, there are no downloads, and second, they really have a great choice of Bingo games. They cover all of it actualy, the classic and mostly played 75 and 90 ball games, but also the 80 and 30 ball games, which are becoming more and more popular. With ten rooms in total (four for 75 and 90 ball games each and one for 80 and 30 ball games each), there's a lot to explore. I love to play various games, and to me the variety is probably the most important thing. Support:24/7 by email, or online chat plus ! 30 Ball, 75 Ball, 80 Ball and 90 Ball Online Bingo!